MANCHESTER, N.H. (January 18, 2016)—An ad unveiled in the Manchester, N.H., airport today depicts the four Republican and Democratic candidates currently leading in state polls standing behind podiums on a local beach, with tides rapidly rising to their waists. 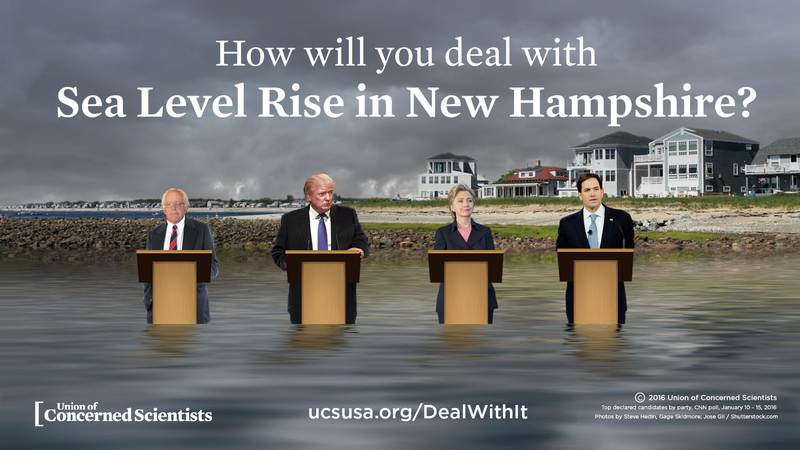 The words above Bernie Sanders, Donald Trump, Hillary Clinton and Marco Rubio read: “How will you deal with sea level rise in New Hampshire?” The animated ad will run for a month on all five of the airport’s video screens, including near security areas, bathrooms and the food court. The Union of Concerned Scientists (UCS), the group that placed the ad, hopes it catches the attention of all the presidential candidates and their reporter entourages as they pass through the airport leading up to the GOP presidential debate on February 6 and primary on February 9. A still version of the ad can be found on the UCS website. UCS will hold a press conference at the airport today at noon. The speakers will include Erika Spanger-Siegfried, a senior analyst at UCS; Cameron Wake, a University of New Hampshire climate and sustainability professor; New Hampshire State Senator Nancy Stiles (R-District 24); and New Hampshire State Senator David Watters (D-District 4).